Posted on Thu, Mar 15, 2012 : 3 p.m.
Who can start their St. Patrick's Day the earliest? Newcomers to the green, gently rolling hills of County Washtenaw have sometimes been surprised by the enthusiasm with which we celebrate our St. Patrick's Day 'round these parts. Well, this year with the sacred beer-drinking holiday falling on a Saturday and the weather forecast calling for May, they ain't seen nothing yet. Following is a list, by no means comprehensive (God help anyone trying to compile that), of what's up in and around Ann Arbor for St. Patrick's Day that might be interesting to the local craft beer drinker. No warranties, express or implied, are given for this list. Websites and phone numbers are provided for readers to use to make final plans. If you're too afraid to go out but still have a morbid sense of curiosity, be sure to tune in to AnnArbor.com, who have foolishly graciously agreed to again publish my live-tweeting St. Patrick's Day adventures. Out and about? Join me in the fun with hashtag #stpata2. Five stouts on tap: Michael Faricy's Irish Stout, Steamroller Russian Imperial Stout, Blackheath Sweet Stout, St. Pat’s Strong Stout and Espresso Love Breakfast Stout. Plus other ABC favorites like Big Ben Mild Ale and the new Roxy Rye Lager, made with 26 percent rye malt and featuring good hop balance and a reasonable 5.1 percent alcohol by volume (ABV). St. Patty’s Day breakfast buffet (see below). After 11:30 a.m., Dubliner Burger, Salmon Sarnie, Irish Reuben, Beef & Mushroom Pie, Savory Vegetable Pie, Fish & Chips. 7-11 a.m.: Top o’ the Morning Party with $8 breakfast buffet (eggs, sausage, biscuits and gravy, fruit, and more) and happy hour pricing. 9:45 a.m.: $5 shuttle bus to the Corner Brewery in Ypsilanti. Includes a beer on the bus! Departure times: 9:45, 11:15, 12:45 p.m., 2:15, 3:45, 5:15, 6:45, and 8:15. 4 p.m.: Live music from the Y-Town Hoolies. No cover. Twenty-four taps with Guinness and many good microbrew options, including selections from Founders, Dark Horse, Original Gravity, and more. Also many bottled options. Good, deep fried pub grub (view menu). All day: $2 green beer, $3.50 Newcastle Brown Ale and Newcastle Founders Ale. 10 p.m.: Late-night happy hour with $2 all "domestics" and $4.25 good beer. >> One of the stops for the Arbor Limousine St. Patrick's Day Shuttle. See the flyer for details. 6:30 a.m. There will be a line. A big one. Meet Saugatuck Brewing rep Scott Farney at a 7 a.m. tapping of Maggie's Irish Ale, a blonde-style brew previously unavailable outside of the Saugatuck tap room. Also 70+ more taps of awesome at "Michigan's premier multi-tap." Breakfast (eggs, sausage, hash browns) from 6:30 until it's all gone. Irish food specials including Corned Beef Sandwich, Guinness Corned Beef Dinner, and St. Paddy's Platter (Irish egg rolls, boxty, artichoke dip) from 10:30 on. 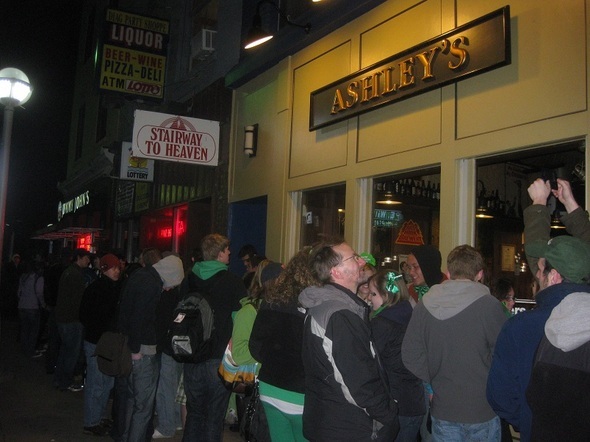 6:30 a.m.: $10 for an Ashley’s St. Patrick's Day T-shirt and breakfast (while supplies last). All day: $10 T-shirts; $3 green Labatt's and Jell-O shots, $3.50 Arbor Michael Faricy's Irish Stout, Arcadia Brigid's Irish Red Ale, Harpoon Celtic Ale, and Saugatuck Maggie's Irish Red Ale; $4 Guinness, $5 Irish car bombs. Forty taps, with around half usually being Michigan microbrews. Breakfast (for pre-registered guests, see below) and other good pub grub (view menu). 7-10 a.m.: $15 Kegs and Eggs Party includes breakfast buffet, live entertainment, and a Bar Louie T-shirt. Note: You must pre-purchase at least 24 hours in advance at this link. All day: $2 green beer, $3 Jameson, $5 Irish Car Bombs. 9 p.m.: Green and White Party with DJ Chuck "CNS" Sutton (Top 40, Hip Hop, R&B, Dance). No cover. Bar Louie Ann Arbor on Facebook. Gotta be honest: I have no idea. I think I was here once and they had something drinkable, like Sierra Nevada. They may have some Michigan beers on tap by now, too. Pub grub (burgers, sandwiches, pizzas, etc.) with some Irish-inspired dishes like Potato Leek Soup and Corned Beef (view menu). All day: $2 green beer, $3.50 Jameson, $4 Guinness, $5 Irish Car Bombs, $5 Irish breakfast (corned beef hash with peppers, potato, and onions, topped with eggs). Or so their minimally updated website says. House-brewed beers with standbys like Bearded Pig Pilsner and Bumper Crop IPA as well as two or three rotating taps. Look for Tamaltach's Irish Red Ale and Cherry Republic Stout. Three happy hours: 9 a.m.-noon., 3-6 p.m., 10 p.m.-1 a.m.
9 a.m.-4 p.m.: $8 Northern Irish breakfast (eggs, bacon, sausage, potato farls, tomato). 4 p.m.-midnight: Corned Pork and Cabbage Dinner and Braised Beef Beer Irish Stew. All day: $5 Stumbling Leprechaun Punch. >> Come back Sunday, March 18, for the St. Baldrick's fundraiser for children's cancer (curing, not causing) at 1 p.m. when Blue Tractor partner Greg Lobdell gets his gorgeous locks shorn for the cause. Check it out here. Green eggs and ham (see below), wings (duh), and assorted other standard pub grub. 7-9 a.m.: $1 Jell-O shots, $2 green beers, and free green eggs and ham, while supplies last. Free T-shirt for the first 100 people in the door. Note: There is a $10 cover charge to enter. You will get a wristband that enables you to leave and come back. Your $10 otherwise entitles you to this. A decent mix of macro and micro brews, served in imperial (20-ounce) pint glasses. Irish breakfast, Irish Boxties, Bangers and Mash, Fish and Chips, Shepherd’s Pie and more (view menu). All day: Unspecified drink specials, live music, bagpipers, and Irish dancers. Sixteen taps of macro and microbrews, including New Holland The Poet Stout, Bell's Hopslam Ale, Dogfish Head 90 Minute IPA, Arcadia Hop Rocket Imperial IPA and, of course, Guinness. Breakfast available (view menu), along with lunch and dinner fare including salads, sandwiches, and burgers (view menu) . Noon: Serving Slow-Roasted Corned Beef. All your favorite Grizzly standbys like Steelhead Red, Victors Golden Ale, and County Cork Irish Stout as well as rotating specials like Little Giant Lager and Amarillo Shamrock Irish Amber Ale. Delicious. Corned Beef and Cabbage on special all day (view menus: lunch | dinner). Happy hour 11 p.m.-2 a.m.: If you can last that long, one of the best happy hours happens in the Grizzly Peak Den: $2.50 for pints. Fantastic stuff from the recently released Hopstadt Altbier to Gulo Noir Black IPA. Two special brews for the day: St. James Infirmary Dry Irish Stout and Snakes on a Shamrock Irish Red Lager. Carry-in or enjoy a menu of corned beef and other Irish type stuff beginning at 3. 8:30 p.m.: Live music from Creole du Nord. No cover. Decent draft selection, including Saugatuck Singapore IPA, Bell's Two Hearted Ale, Frog Island Amber Ale, Keeweenaw Widow Maker Black Ale and others. More Michigan beers by the bottle. Pizza! And other good food (view menu). All day: specials on Guinness, Jameson, and Black and Tans (prices unconfirmed). >> The rooftop tiki bar is open! Four stouts on tap, including Michael Faricy's Irish Stout, Espresso Love Breakfast Stout, Six Year Potato Stout and High King Imperial Stout, plus other swell Corner brews. Breakfast buffet (see below) and various St. Patrick’s Day specials. 7-11 a.m.: Top o’ the Morning Party with $8 (or just $6 with this coupon) all-you-can-cat breakfast buffet (eggs, corned beef hash, bagels, fruit, Lucky Charms, coffee, and orange juice) and happy hour pricing. 9 a.m.: $5 shuttle bus to Arbor Brewing in Ann Arbor. Includes a beer on the bus! Departure times: 9 a.m., 10:30 a.m., noon., 1:30 p.m., 3 p.m., 4:30 p.m. and 7:30 p.m.
7 p.m.: Live music from Kevin and the Glen Levens and Deep Space Six (at 10:30). No cover. >> The beer garden is open! No green beer. But you can get Short's Black Cherry Porter and plenty of other local and Michigan craft brews on tap. All Day: $2 Jameson shots from the whiskey fountain, $3 Guinness and Black and Tans, Guinness floats, and Ugly Mug Irish coffees. Live music from bagpipers, Nick Bertsos, and other tunesmiths throughout the day. No cover. Midnight: Free raffle of fabulous prizes and groovy giveaways. Solid lineup of local and Michigan beers: Arcadia Brigid's Irish Ale, Angler's Ale, and Starboard Stout; Midland Brewing Dublin Street Stout; MillKing It BRIK Irish Red; Dragonmead Erik the Red; Short's Uncle Steve's Irish Stout; Arbor Michael Faricy's Irish Stout; plus cider from Northville Winery. Breakfast chow while it lasts, lunch specials include Corned Beef and Cabbage, Irish Stew, Corned Beef Sandwiches, and Reubens, plus the regular menu (view here). 9-10 a.m.: $1 green beer and $3 Michigan drafts (then $1.50 and $3.50 after 10 a.m. and $2 and $4 from 11 to close). 9 a.m. - 3 p.m.: $2 bottles of McSorley's Ale and Smithwick's ($2.50 from 3 to close). All day: $2.75 Guinness (cans), $5 Irish Car Bombs. The popular Holy Confusion Barleywine returns for a St. Patrick's release and four small-batch stouts will also be released: Jamalamadingdong (breakfast stout aged on Equadorian cocoa nibs), Tuscan Coffee Stout (brewed with coffee from South Lyon's Tuscan Cafe), Blackberry Oatmeal Stout (stout re-fermented with fresh blackberries), and Irish Dry Stout. Carry-in only, but there are many nearby options. All day: $1 Baseline Bitter Ales. Also raffle drawings throughout the day with prizes including shirts, hoodies, pint glasses, gift certificates, and three lifetime Mug Club memberships. The three Mug Club drawings will be at 11 a.m., 5 p.m., and 11 p.m., with the last one including a hand-blown custom mug. Raffle tickets are $10 each and on sale at the pub now. Starkweather Stout, Burnout Stout, Rocket Porter, and other great Liberty brews on tap. $10 for Corned Beef and Cabbage and a Starkweather Stout, while supplies last. 1 p.m.: VIP brewery tour for Michigan Brewers Guild Enthusiast Members. RSVP to joe@libertystreetbeer.com. Five stouts on tap: Lumpy Oatmeal Stout (nitro) plus small batches of Coffee Stout, English Dry Stout, Imperial Chocolate Mint Stout, and Milk Stout. Homemade Irish Beer Stew (made with Oatmeal Stout) and Corned Beef Sandwiches on Beer Bread from the Erie Bread Co., while supplies last. Fri, Mar 16, 2012 : 2:15 a.m.
Great job, D! I am sure I will see you out and about on that very special day--my birthday! Oh yeah, and something about a saint and snakes? Fri, Mar 16, 2012 : 2:14 a.m.
Thu, Mar 15, 2012 : 8:42 p.m.
David, A great job with the list. Thanks loads! Thu, Mar 15, 2012 : 8:22 p.m.